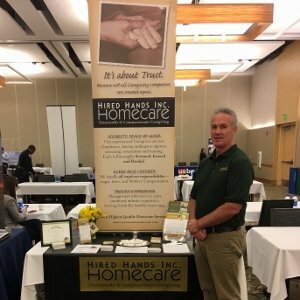 Out and about with Hired Hands Homecare in Sonoma Co.
Its a busy Thursday, with Hired Hands Homecare supporting two great events today! Phyllis and Estafania proudly join the Santa Rosa Chamber of Commerce in the supporting the fabulous Annual Latinos in the Workplace Conference. “Latinos in the Workplace” conference is an educational forum that seeks to help all employers provide a safe, productive and enriching work environment for Latino employees and empower Latinos to become tomorrow’s leaders. This conference has become a branded annual event in our local business community presented by Michael Lopez, Vice President, Vantreo Insurance Brokerage in partnership with the Santa Rosa Metro Chamber. Michael Lopez founded the “Latinos in the Workplace” conference over 13 years ago. Proceeds Benefit Mike Hauser Academy and Elsie Allen High School Foundation. Thanks to our generous sponsors, the 2017 conference proceeds provided almost $20,000 to the Academy and the Foundation. The 2018 conference, “The Future is Today,” will focus around leadership, diversity, and culture. For more information, please visit http://www.santarosametrochamber.com/events/2018/03/08/chamber-events/2018-latinos-in-the-workplace-conference. And just down the road, Erick and Blake are answering questions and speaking with students at Sonoma State University’s 2018 Spring Career Fair, running Thursday, March 8 from 11:00am- 3:00pm in the Student Center Ballroom. This event is free for all students and no pre-registration will be required. However, students must bring their Seawolf I.D to gain access, and all students are strongly encouraged to come prepared with printed resumes and dressed in professional attire. Leading up to the fair, Career Services will be offering a series of workshops to better prepare all students for the Career Fair and or future employment and internship opportunities. For more information on the Career Fair, please visit https://www.ssucareerfair.com and or reach out to the Career Services team at careerservices@sonoma.edu. 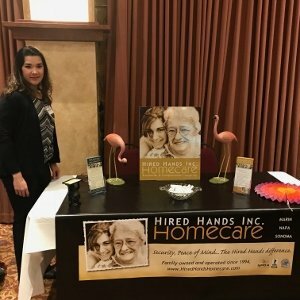 Hired Hands Homecare is proud to support our local communities, while providing outstanding career opportunities for our diverse workforce. Join us!